-Identify the bridge and its location. This is the eastern Motor Parkway Bridge over the Northern State Parkway built by New York State in 1931. 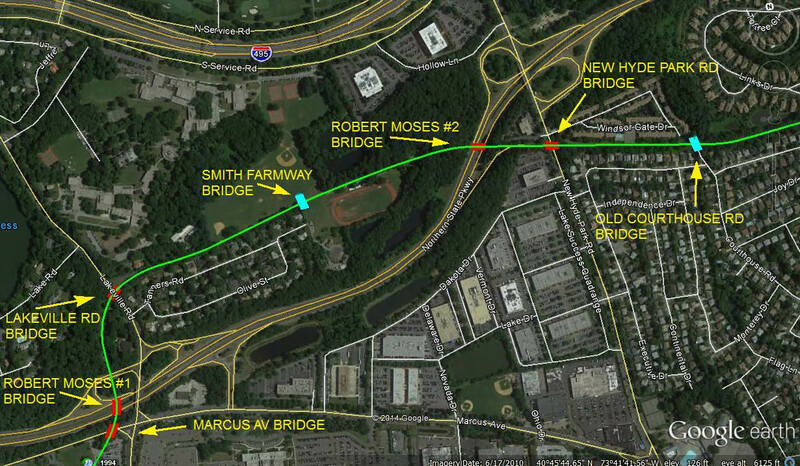 The Lake Success/New Hyde Park bridge was to the west of the New Hyde Park Road Northern State Parkway Bridge. The photographer was facing east. The embankments of the New Hyde Park Bridge can be barely seen through the bridge. 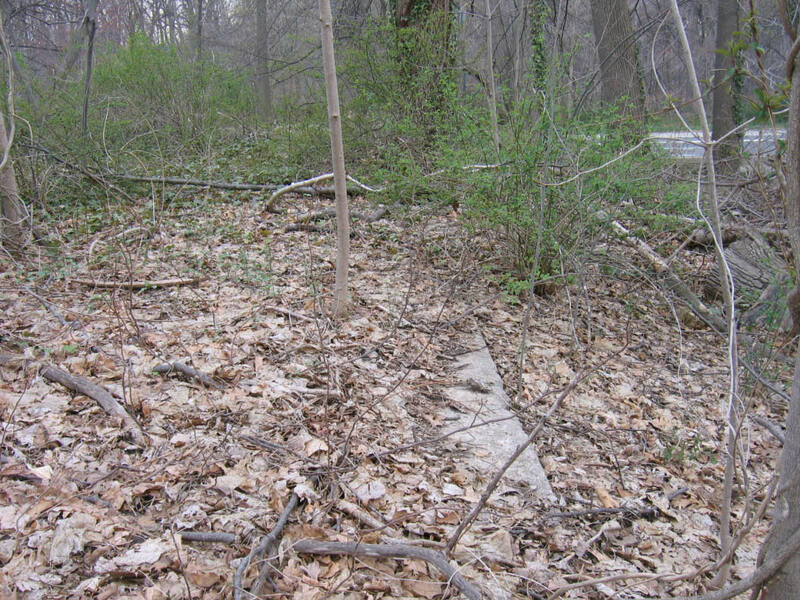 The western Motor Parkway Bridge over the Northern State Parkwat was closer and parallel to the Lakeville Road Bridge. -What year was the photo taken? The bridge were taken down beginning in 1967. So 1967-1968 would be correct. -Identify the automobile in the photo. Update #1: As per Peter Heidgard (see comment below), the automobile is a 1965 Pontiac Le Mans. Congrats to Joe O., Greg O., Michael LaBarbera, Tim Ivers, Erci Shaffer, Sam Berliner, Art Kleiner, Steve Lucas, Brian McCarthy, Desmond McGlynn and Frank Femenias for correctly identifying the Mystery Foto Bridge. Kudos to Ken Harris and Michael LaBarbera for identifying the 1965 Pontiac Tempest.. The caption on the original photo reads "L.I. Motor Pkwy New Hyde PK. Bridge"
Another view of the bridge likely taken at the same time. Note the New Hyde Park Road Bridge further east in the background. Current view looking east toward the New Hyde Park Road Bridge. Courtesy of Frank Femenias. A close-up of the automobile. Note the grill design and the logo near the headlights. The grill design matches the 1965 Pontiac GTO. However, the grill and logo match the 1965 Pontiac Tempest as noted by Ken Harris. The logo on the 1965 Tempest was "Pontiac". 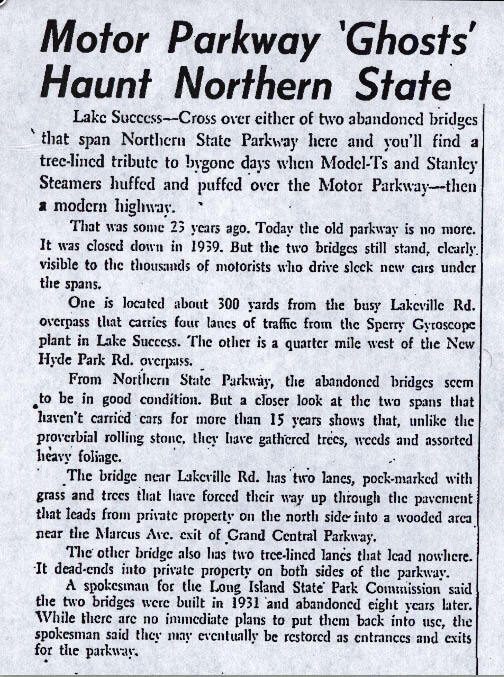 Newsday article September 29, 1954 "Motor Parkway 'Ghost' Haunt Nortern State. Courtesy of Art Kleiner. 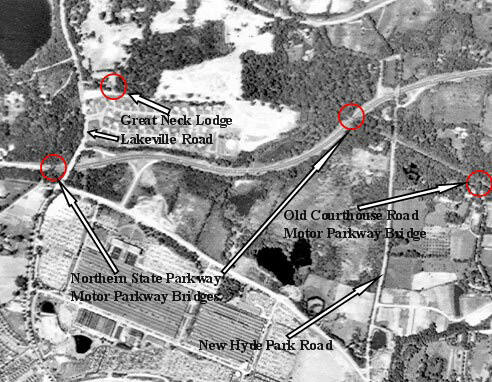 A 1955 aerial of North Hills and Lake Success. The complete aerial from Glen Oaks to Searingtown. Concrete extensions of the Motor Parkway lead up the north embankment. Courtesy of Art Kleiner. On top of the north embankment. 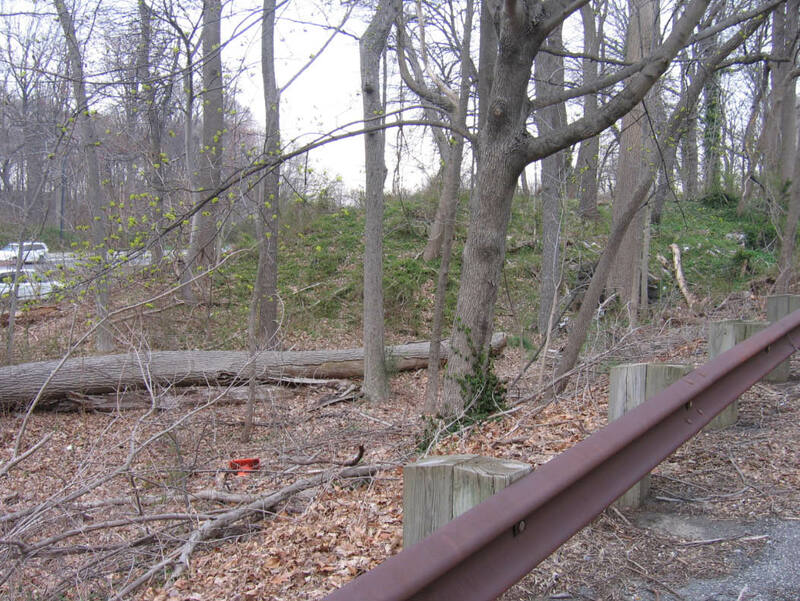 A view of the southern embankment can be seen from the entrance ramp to New Hyde Park Road. Courtesy of Art Kleiner. A view from atop the southern embankment looking north. Courtesy of Art Kleiner. 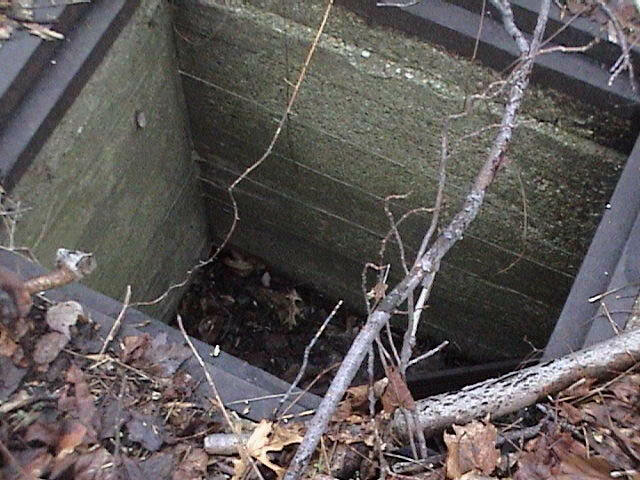 A mysterious well was placed near the bridge. 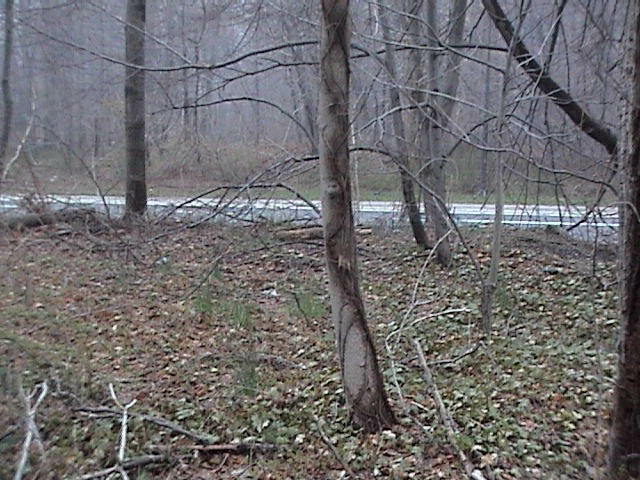 LIMP crossing the Northern State Parkway, just west of New Hyde Park Road. The photographer is facing east. The year is about 1969, when the NSP was widened. Not sure of the auto. -joe o. 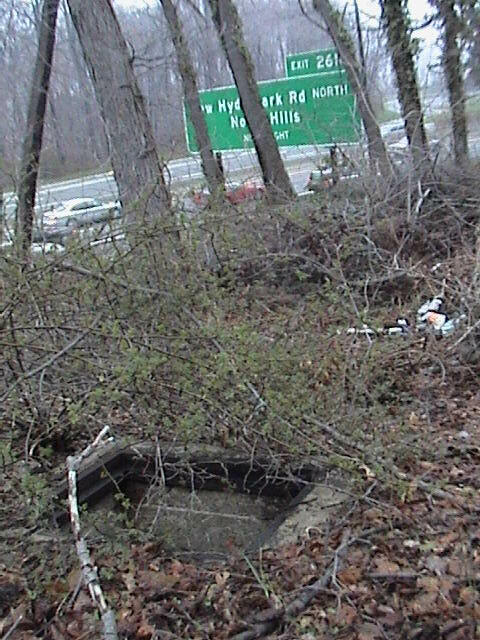 The Robert Moses LIMP bridge over the Northern State Pkwy immediately West of New Hyde Park Rd. East. Looking closely reveals the New Hyde Park Rd bridge just beyond the curve under the bridge. 1967. 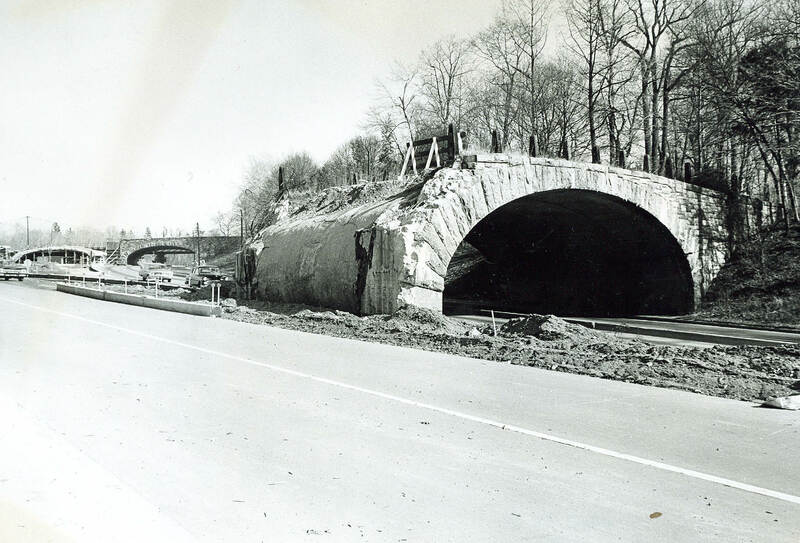 While the NSP widening project started planning in the early 60’s, the work didn’t actually begin until 1967. Purely a guess, but If it’s correct, that’s one very nice car!.... A 1965 Pontiac GTO! Looks like the dismantling of the NSP Motor Parkway Bridge next to Lakeville Road , my guess is facing east in the early 1970s during the widening of the NSP. Nice 67 GTO headed west. New Hyde Park Road bridge over Norther State Parkway. Bridge is Salisbury park drive on Northern State Parkway. automobile is a 1965 Pontiac GTO. Good topics for discussion, Howard. 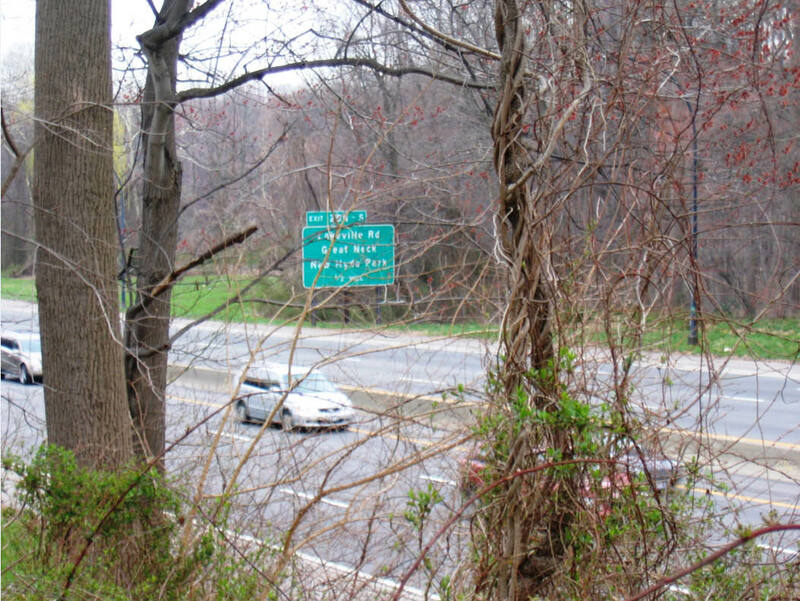 The bridge is one that Robert Moses built going over the Northern State Parkway just west of exit 26, New Hyde Park Road which is seen in the background. 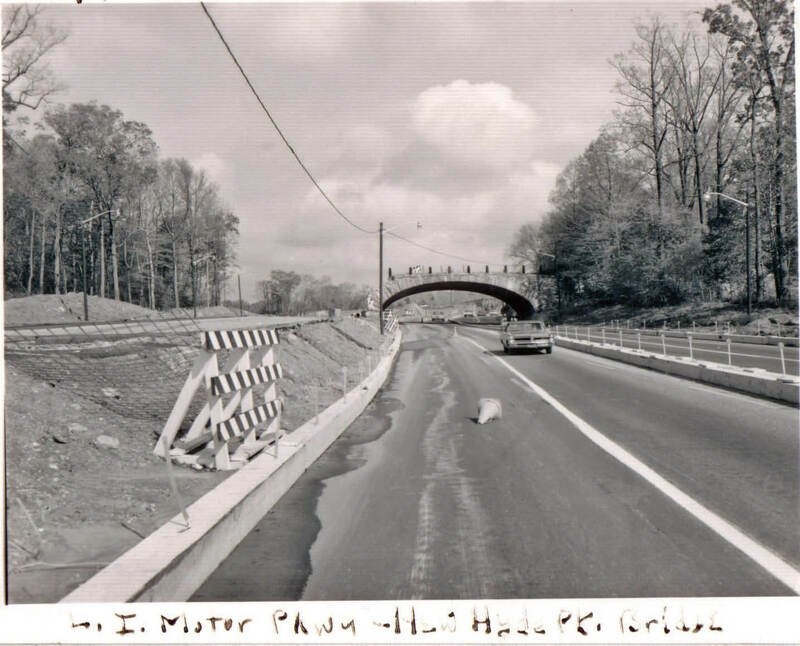 Assuming the bridges were taken down as part of the widening of the Northern State Parkway, the photo would have to have been taken in 1967 or shortly thereafter. According to several New York Times “art"icles in 1965 budgets were approved for the parkway’s widening but another article from 1969 indicates the widening actually didn’t start until 1967. 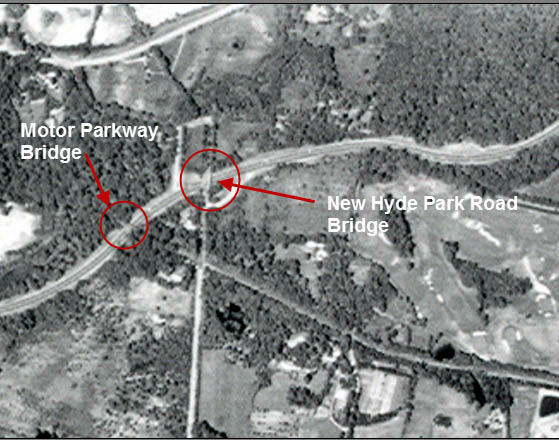 And a 1966 aerial photo shows the bridge still over the Parkway. The car is a 1967 Pontiac Bonneville based on its grill, the headlights being one over the other, and the placement of the Bonneville logo in the grill. 1966 and 1968 models were somewhat different; another piece of evidence the photo was taken 1967 or after. Howard - look for my e-mail to be sent shortly with the above supporting documentation concerning the date of the photo. That looks like the Motor Parkwy bridge over the Northern State a short distance west of New Hyde Park Road (seen in the background). 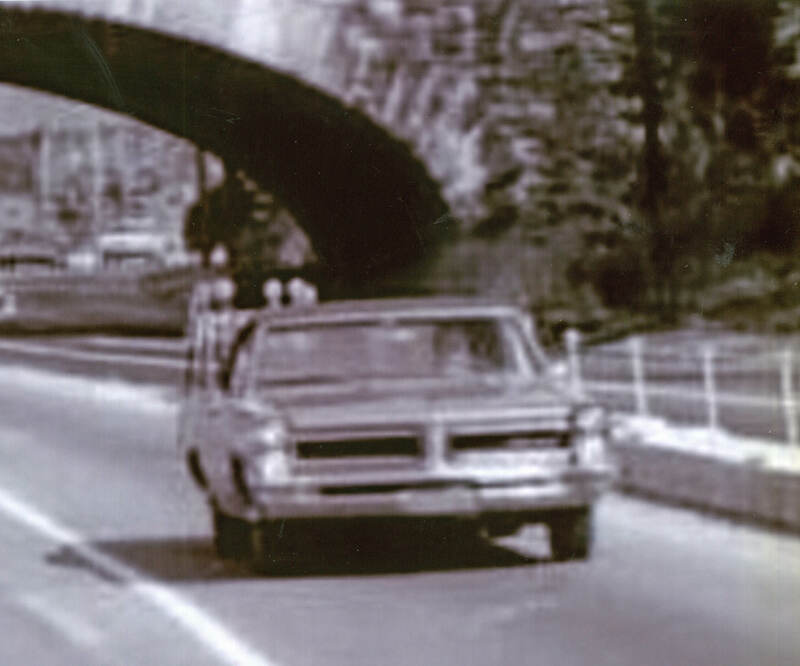 The photographer is facing east with the 1963 Pontiac heading westbound. I believe the date of the photo was about 1964. This is the one of the LIMP bridges that Robert Moses agreed to construct so not to sever the LIMP while NSPkwy was being built. This overpass is just due w/o New Hyde Park Rd. This photo is facing E/B (The NSPkwy is being widened to the left of the photo, early 1960’s). I’m not enough of a car fan to know what the make is, but I do recall dreams of me driving cars that look like this; too much said I guess. Northern St. Pkwy. Facing east. This is Robert Moses’ second bridge built over the NSP just west of NHP Rd. Not sure of its name but it was captioned as Great Neck Bridge on Harvey Kidder’s painting. The vehicle is a ‘65 Pontiac Tempest/Lemans and the one following looks like a ‘65 Mercury, both heading West on the NSP. Photographer is looking East. I’m guessing it’s 1965 but that seems too late for completion of roadway expansion in time for the World’s Fair. Good luck to all on this one. Yes, the bridge was built in 1931 by Robert Moses in anticipation of the building of Northern State Parkway. Today I learned that there were 2 bridges over NSP, and from the looks of the car it seems that it may be a Bonnevile or Tempest, the grill seems wider than the G T O and the letters in the grill appear longer than 3 letters. thanks ! Sorry I didn’t see this sooner. I believe the car is not a 1965 GTO, but a close relative: a 1965 Pontiac Tempest. 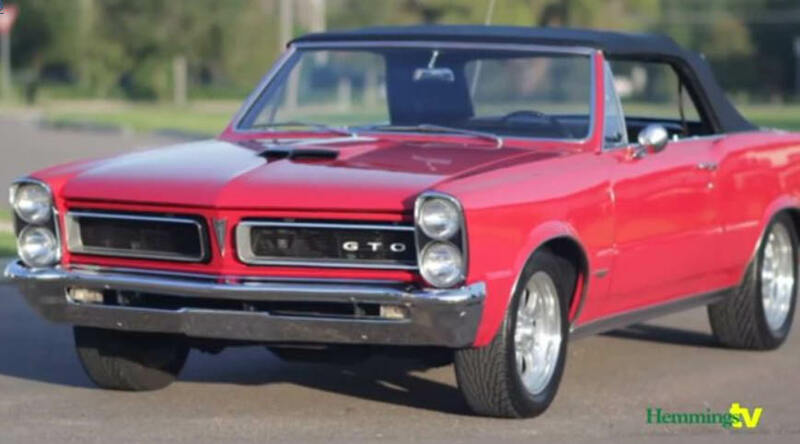 The GTO was based on the Tempest but had a hood scoop and the letters GTO on the front. The car pictured has neither which tells me that it’s a Tempest. I got this late too but I knew the car was a 1965 Pontiac. I wasn’t sure about the bridge. It’s a shame that for all of the cost and labor to build it the bridge was in service for only seven or eight years. Howard - is the well on the north or south side of the NSP? I did a little better on this one. I knew something about the bridge, it was built by Robert Moses and the make of car. The model and year wasn’t determined yet, or was it? Michael and Ken: I believe you’re right on with the car! Mike: Not only a shame but the intended time frame for completion was so delayed for the major event (The 1964 World’s Fair!). I believe at this stage of his reign, Robert Moses had already lost most of his pull and influence to effectively get the job done. Looking around, today we still live amongst his ruins, and still love it. He was truly a great leader but didn’t go without blemishes. 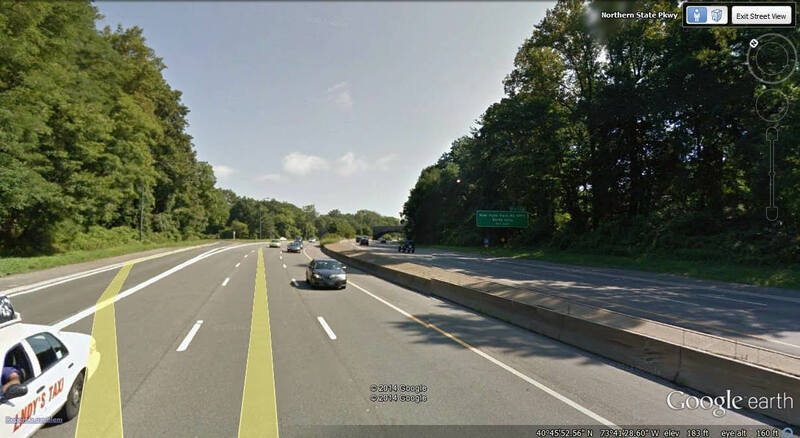 by the way….can you get actually pictures of this location before the construction started on the parkway? The Pontiac in the mystery photo IS, POSITIVELY, NOT a 1965 Pontiac GTO, and it is POSITIVELY NOT a 1965 Pontiac Tempest or Tempest Custom. 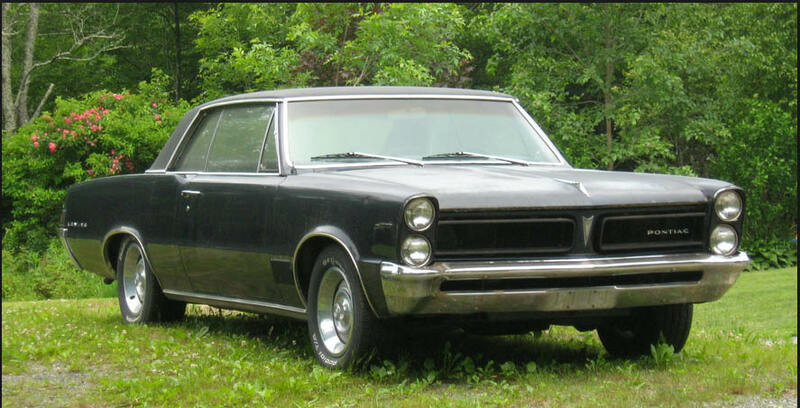 It IS however, a 1965 PONTIAC LEMANS. Tempest and Tempest Custom shared the same grilles that year and the GTO based off of the LEMANS, shares that models grille. From a distance looking at a 1965 Pontiac Le Mans vs GTO you can tell by the placement of the nameplate in the LH side grille, and on the GTO models, by the hoodscoop that those models had How do I know this? I love old PONTIACS prior to 1972.